Especially when, as with Andrew Dallmeyer's contribution to "A Play, A Pie and a Pint", the play does little to merit further thought and the production is technically problematic. So, in what will hopefully be a one-off departure from our usual attempt to provide constructive criticism, I'll simply quote from today's dialogue - "Dismal to the end. Save your breath. No need for words." 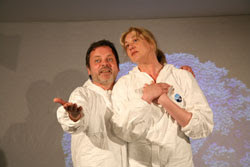 "Too Clever by Half" runs at Oran Mor until Saturday 25th April. Ouch. Even I felt the sting on that one. Utterly ridiculous review clearly written by someone who has no concept of good theatre. I regularly attend a play, a pie and a pint and this was the best play i've seen there in a long time. I think I was pretty up front about my comment being an admittedly cheap shot and not what we generally aspire to provide. That said, it does absolutely and accurately reflect my feelings for the show. And I suspect it may even have been kinder than a forensic analysis of the show's failings. As for "good theatre"? Good theatre makes me think. Good theatre makes me feel. Good theatre makes me believe. This didn't. But do feel free to tell us what you enjoyed so much about it. Good theatre makes me feel, believe and think which is what I felt the play did. I felt it to be an accurate representation delivered in an intelligent and thought provoking way of how the nation lives off fear and uncertainty. I thought the collaboration of technology and a beautifully written script were the perfect marriage. Everyone is entitled to their own opinion, otherwise the world would be a very dull place; however, I felt compelled to yours. This is among the worst pieces of theatre I've seen. Watching the actors struggle through it was like watching someone drown. I actually considered walking out 15 minutes in as the characters slept, so I could enjoy the sun in the Botanics.